They were crying. I’ll admit it, if I didn’t have to the be the grown up, I might have felt like crying myself. We had arrived at our campsite at Indian Springs after several hours of hiking narrow mountain trails in the rain. It was cold. I’d shared my gloves with my 12 year-old son that was hiking with me. His twin brother hadn’t brought gloves either, and his hands were like ice. I quickly set the tent up as the last of the light faded. Get your gear into the tent and start setting up your sleeping bags. I got mostly mumbles and wimpers. And get out of those wet clothes. Put on dry socks and make sure any of your wet gear is set to the side. I next got started on dinner. Basically, it involved boiling water and then pouring it into zip lock bags full of dried lasagna and pasta alfredo. I checked back in with my boys. Are you guys getting your stuff set up? I can’t. My fingers won’t move enough to unbuckle my pack. I felt like a bad parent, like I was the one responsible for their pain and suffering. Earlier, on the trail, my son had needed tons of encouragement just to keep going. (My 12 Year Old Was Braver Than me.) He didn’t want to be there. He wanted to be home. It’s shorter to go forward than to go back at this point. And he would set his shoulders and trudge for another couple hundred yards. I don’t do a lot of regular exercise. I try to take the stairs at work and my diet is pretty good, but frankly, the hike was tough on me as well. My pack was approximately 35 lbs. I was also carrying a half gallon of water (4 lbs) and my rain gear and hiking clothes. At one point, it was clear that my son was at the end of his endurance. He dropped his 30lbs pack and seemed on the verge of giving up. Tell you what. I’ll carry your pack for a while. Do you think that will help? All he could manage was a tired nod. And then he turned and headed up the trail. There’s a way to carry a second backpack. You wear it on the front and wrap your arms around it. Unfortunately, that just meant I couldn’t see. So, I slung it over one shoulder. The first step was brutal. I felt like my feet had been encased in concrete. The hike was challenging before, now it was staggering. Fortunately, my son was already headed up the trail and didn’t see just how difficult it was for me to take his load in addition to mine. 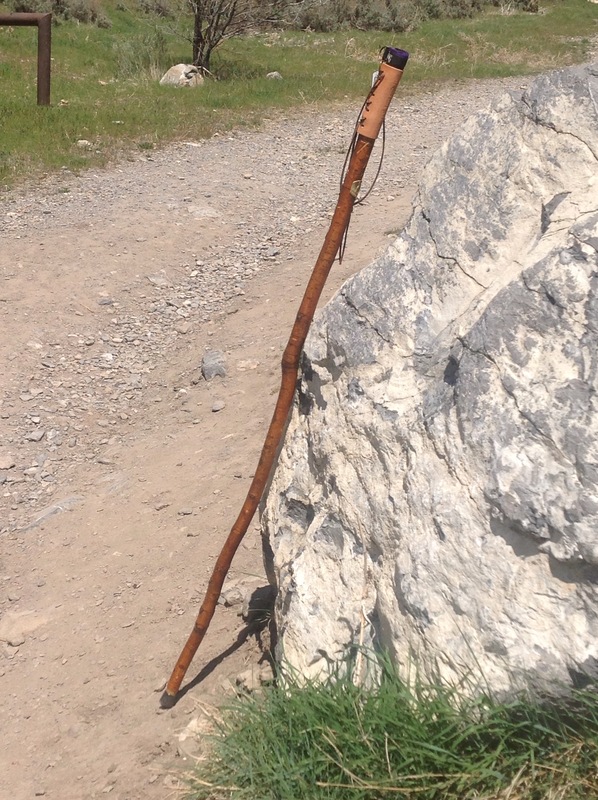 I staggered up the trail, one hand clutching his pack, the other using my staff to literally lever my way up the trail. I have no idea how long I could have carried it. Fortunately, my son found his strength. I think I can take it now, Dad. And he carried it the rest of the way. Do you have the privlege of doing hard things at work? That probably sounds crazy. It’s a chore to do the hard things. When we are building our call centers, there comes a time when we have to work nearly non-stop to get the computers on the desks and configured. Our desktop engineers do the builk of it, but I have spent several nights helping uncrate PCs and put them desks. We typically work 18-24 hour days during that time. Is it a prilege to do that work? Should I feel that I *get* to do it as opposed to *have* to do it? Doing hard things gives you two benefits that you cannot get any other way. First, it binds you to your team. We have 18 boys in our troop. Only five of them went on the hike last weekend. Those five did a hard thing. And when they start talking to their friends as 12-year olds do, the five who did the hard thing will have something special binding them together. They will have shared not just a hike, but an experience. The same thing applies to your teams. Ask them to do the hard thing and it wil strengthen them as a team. Second, it teaches you that you can do it. People decry our culture of awarding participation trophies and parents who “helicoptor” in to spare their child any inconvenience or difficullty. But, when a boy, or girl, woman or man does a hard thing and finishes it, they come to realize that they are made of sterner stuff. It was clear that nothing was going to happen in the tent with my sons gear getting unpacked until I solved his being cold. The water wasn’t quite to a boil, but it was close. I poured it into the zip lock bag holding his dinner and stirred it up. Just holding the bag warmed up my freezing hands. Here, eat this. You’ll feel better. Antoher package for the other son and then a package for me and I joined them in the tent. Already the magic of warm food was starting to take effect. We each kept one hand on our dinner, using the other to unpack our sleeping pads, bags and dry clothes. Yeah, I think I can get my stuff out now. It’s a privilege not everyone gets.